The kids and I are departing for a weekend of beach camping. The weather reports suggest a 50% chance for rain. This is very unseasonal for September in the Top End but thanks to the weather report we will be prepared for any downpours. We are going to Dundee Beach in fact we will camp on the beach to the north of Dundee at the furthest point. 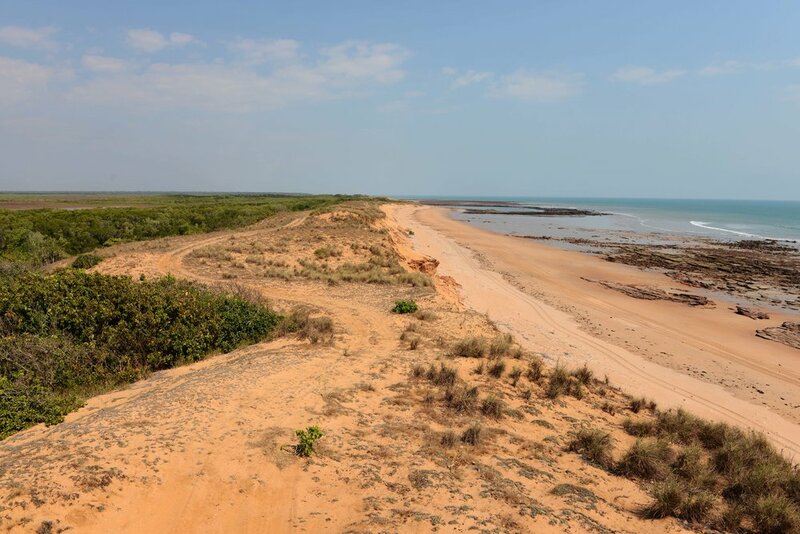 The journey from Darwin to Dundee Beach is about 130km of blacktop road. Note you are traveling to Dundee Beach and the easiest is to follow the signage to “The Lodge of Dundee”. Beach to the south of "The Lodge of Dundee"
Tractors on the beach to launch boats. I always stop in at Dundee Lodge as it has its own remote charm. It is often a hive of activity that generates its own aura of excitement. Locals with the obligatory long grey beards arrive on quads to get the latest news and catch up. The boat ramp that is just in front of the lodge has fishermen coming and going in tinnies of all sizes. 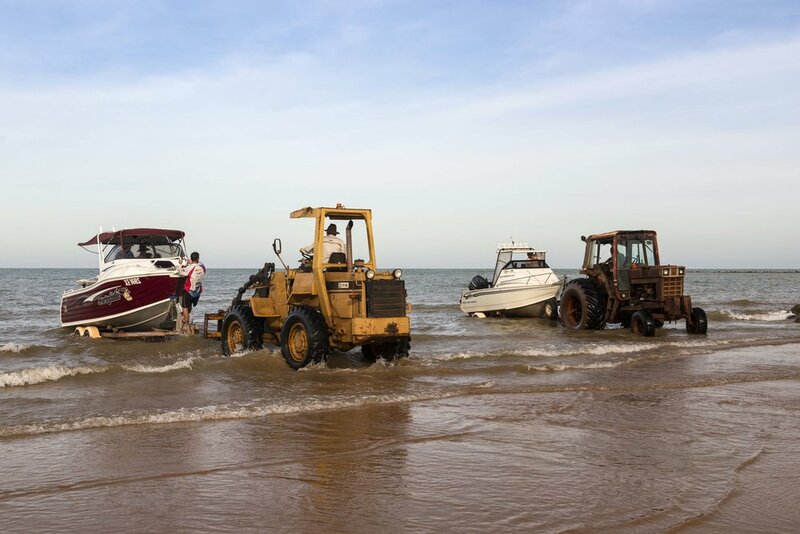 Tractors are bustling up and down the beach to launch boats. The restaurant and bar are at the centre of this activity and we always stop over for a meal or at the very least an ice cream for the kids. The lodge offers good beach access to the north and the south of the lodge. Anyone can come and enjoy this area, as it is a tar road to the lodge’s doorstep. We grab a few bags of ice get the obligatory ice creams and head off to explore. 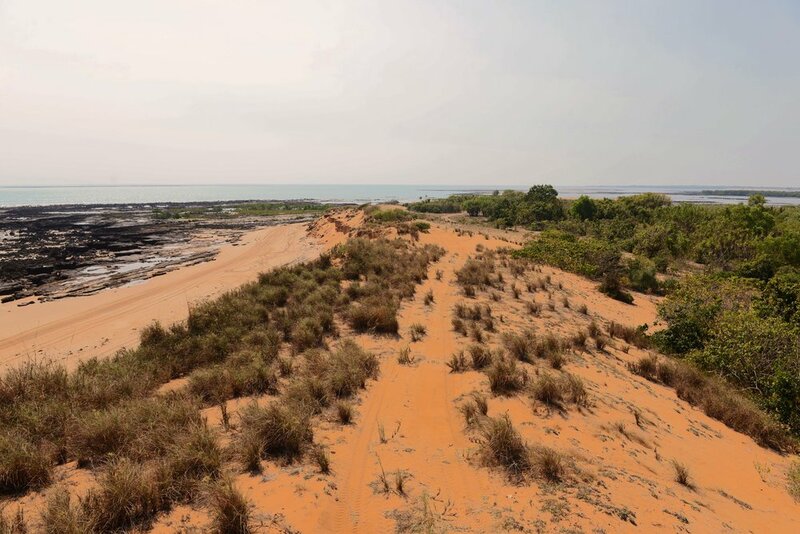 Access to the beaches north of the lodge is via a dirt track that initially follows the back (east) fence of the lodges camping grounds. At the end of Namarada Dr the road makes a 90-degree turn into Dundee Pl that leads to the lodge. You gain access to the track by continuing of Namarada Dr in a northerly direction. This is not an official track and has no signage. The track is about 14 km long, 7km out to the point and 7 km back again. This is a fun 4WD track however it does entail driving on the beach or on tracks just behind the dunes. It also makes for a great day trip from Darwin. A track that should be accessible to most 4X4’s however I would grade this as a tough Medium track (grading Victoria Parks). Graded as a medium because sand on the beach may be thick and soft in sections as well as a tidal river crossing. As with any beach driving try and time your trip so that you get to the beach on an outgoing tide this gives you the most time to enjoy the beach. Always try and drive below the high water mark as this results in the least ecological impact. Turtles use this section of beach as a nesting ground so please stay below the high water mark. Most of this track does offer the option to travel behind the dunes and still provides a great off-road experience. Make use of this option if the tide pushes you above the high water mark. This track can be cut short and to avoid crossing the tidal river. If you are crossing the river give yourself enough time to get back over the river on the homebound journey. In the wet season watch out for rain as it can dramatically increase the flow in the river and may see you caught on the opposite bank. The first 900m of track starting at the end of Namarada Dr will take you parallel to the coast. This section of track is firm however in the wet season it is very pitted with deep flooded holes. Most of the deeper sections do have alternate routs around them. (Note if you continue in a northerly direction on this track it will lead to the river. It does however open into a section that can form part of the flood plain in the wet season and this section does have a black clay/ turf base that could get you bogged.) Take the first turn to your left (towards the west) after about 900m and travel towards the beach. As you approach the beach you will encounter a T-juction take a left in a southern direction. Following this road will get you to a large tree that provides a good spot for a pick nick. Stop enjoy the view, deflate your tires in the shade of the tree and then move on in northerly direction along the beach. Continue along the beach for about 900m then start looking for a way up behind the rocky outcrops that extend into the sea. Travel inland of these rocky sections for the next +/- 800m till the beach opens up again. The next 700m is again on the beach and this will bring you to the mouth of the tidal river.This is a great spot to try your luck at fishing; both in the river section as well as in the sea. However beware this is saltwater crocodile country. If the tides are against you or if you just don’t wish to risk the river crossing take the trail back that runs behind the dunes. In my experience the best way to cross this river is at low tide when the rocks on the southern section of the river are exposed. I always walk this section first as the bottom changes from one high tide to the next. Travel out about 100m towards the sea walk the riverbed and find a section that provides a rocky bottom to cross over. I also walk the section on the north bank of the river, as this is probably the most risky area to get bogged. The section on the north bank has a large gradual sloping sand bank. Check that this section is firm and not boggy before crossing. Once over the river you have access to another 2.3 km of beach before the peninsula breaks up into numerous small islands. This area has a large rocky outcrop that is great for exploring rock pools. If time allows try wetting a line. 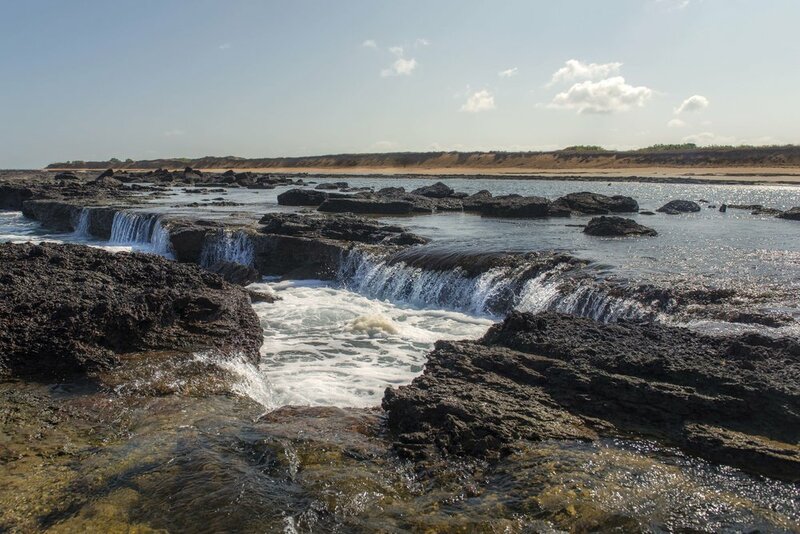 One km after crossing the river you pass an interesting rock formation that has formed a large natural tidal pool. This is again a great place to explore the rocks at low tide; the very adventures may even consider a swim? We find a lot of turtle tracks and nesting on this section of beach, please avoid traveling above the high water mark. I have spent many hours walking up and down the beach at night looking for turtles here and one day I will be rewarded to find one nesting. Take the same route back or consider traveling along the back of the dunes. Why would I take Native Point 4WD Track? A day on the beach exploring rock pools, fishing, flying kites and picnic what more reasons do you need. If you’re lucky you may even get to see turtles laying eggs. It provides for a good beach drive and a great off-road adventure for the family. The option to have a bite to eat and cold beverage on the way home helps sell it to mom.